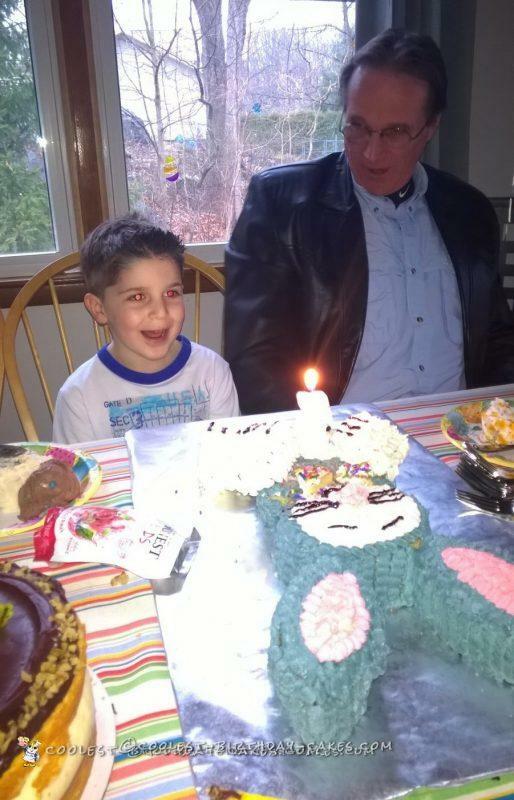 This year, my son’s birthday was three days after Easter, so for Easter Sunday he wanted a grey birthday bunny cake. The week before Easter I made two round cakes (I used 1 ½ batters so they were really high; I then leveled them) and froze them. Freezing them helped when it came time to cut the shapes out as the cake didn’t crumble because it was still firm. When I went to make my grey frosting, the black tinting gel must have gotten on my hand which touched the bottom of the bowl I was mixing the frosting in. Well everything I touched had a black finger print…I wiped it off and AGAIN there was another black print. I finally realized that the black gel was all over the bottom of the bowl. After mixing the black tinting gel in the frosting, the color grey was defiantly not the color grey I was hoping for but more of a bluish grey. I began to decorate and realized that the frosting was too thick to come out the tip, so I needed to add more water, made it too thin, had to add more confectionery sugar, etc. I finally got the correct consistency and began decorating. 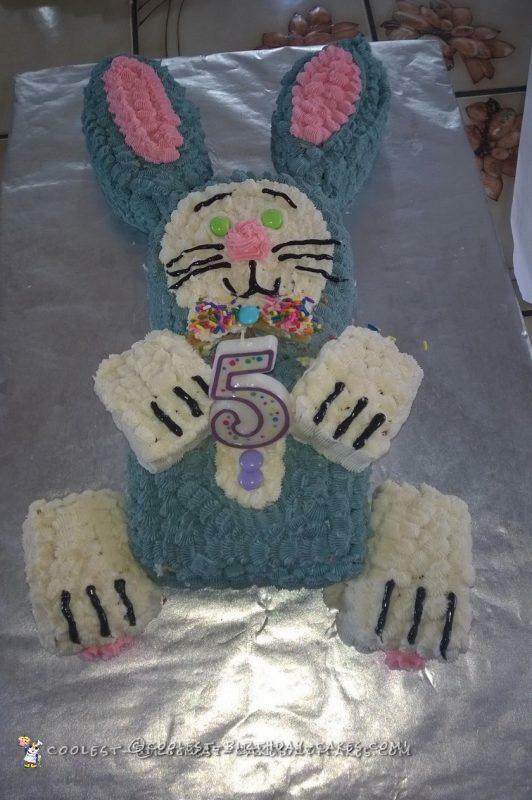 I then ran out of the grey frosting and knew I wouldn’t be able to get that same color “bluish grey” again so I decided to make a white & grey bunny. I had just enough frosting to cover the whole bunny but not enough for the bow tie I decided to make, so I covered that with sprinkles. 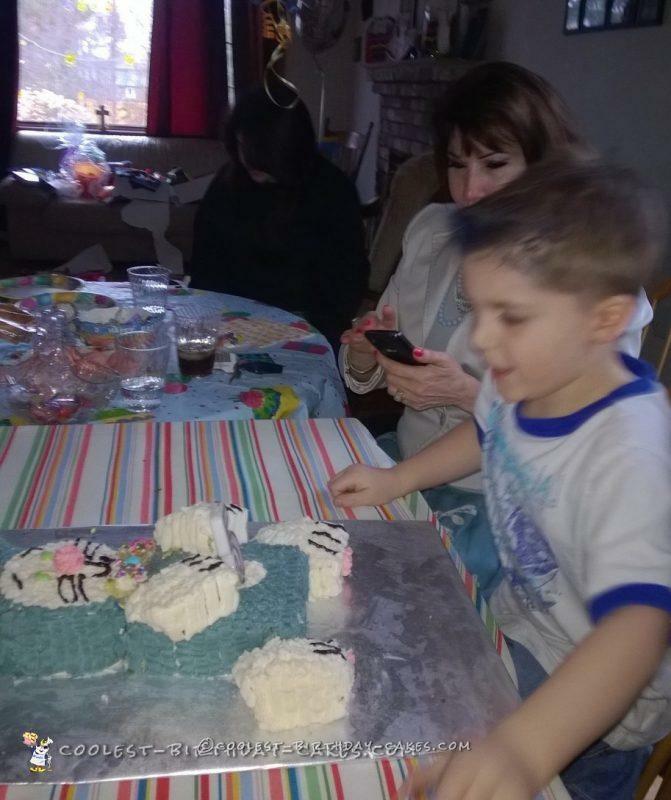 The look on my son’s face when he saw the cake made all the work and aggravation worth it!